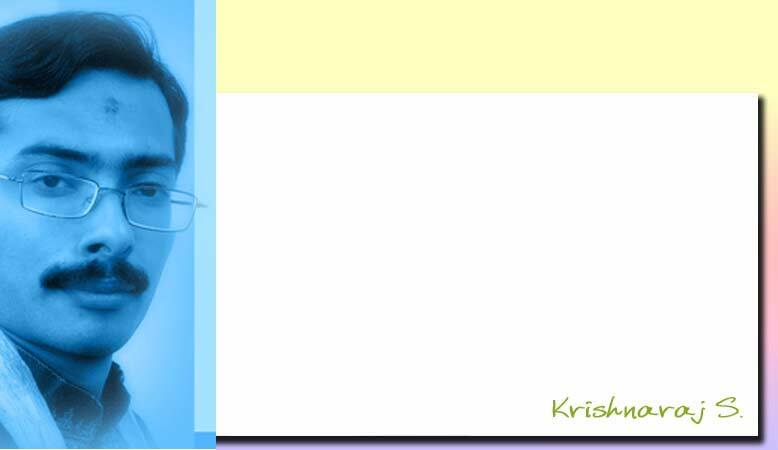 Krishnaraj S., the chief editor and publisher of www.carnaticindia.com is a post-graduate in Journalism and Mass Communication, He earned his graduation and masters degree from Mahatma Gandhi University and is also an M.Phil in Journalism and Mass communication. He is presently working as the Public Relations Officer at ipsr solutions ltd., a public limited IT company based at Kottayam, Kerala. He has learned violin in the classical carnatic style for the past fourteen years. As part of his mission to make Carnatic music more popular, he has launched a website, www.carnaticindia.com, as a harbinger to the appreciation of carnatic music for a beginner. The aim of this website is to make people with similar thoughts and aspiration to interact mutually and thus give a new life to our ancient tradition of carnatic music. He is also a columnist in the Whiteline Journal, a magazine published from Mumbai. He is having a very long association with the website jeevan4u.com and is also one among the managing editors of the site. He is also one among the founder members and the Secretary Finance of Indian Web Masters Organization (IWMO). Mr Krishnaraj is furthermore a soft skill trainer offering sessions on personality development, motivation, placements and life enhancement.